Ramya Vijeta Department of Orthodontics and Dentofacial Orthopedics, Manipal college of Dental Sciences, Manipal Academy of Higher Education (MAHE), Manipal, Karnataka, India. Sangamesh B Department of Orthodontics and Dentofacial Orthopedics, AME’s Dental College and Hospital, Raichur, Karnataka, India. Objective: To comparatively assess electromyographic (EMG) activity of masseter muscle and maximum bite force among various facial divergence pattern. To compare bilateral variation therefore derive the clinical importance changes in masseter EMG activity. Materials and Methods: The sample size comprised of 90 subjects, age ranging from 16-25 years. They were further classified under three subgroups-normodivergent, hypodivergent and hyperdivergennt based on the cephalometric values. Tekscan Flexiforce B201H sensor along with the associated software was used to record the bite force. The EMG of the superficial masseter muscle was recorded using Biotech Neurocare 2000 surface electromyography machine. The muscle activity was recorded bilaterally from the superficial masseter. The data obtained were statistically analyzed using ROC curve at p<0.05. Results: The bite force of the Hypodivergent group (571.83N±36.65) was more than the Normodivergent (387.26±27.20) and Hyperdivergent groups (373.21N±29.23). The EMG recording of masseter muscle activity in Hypodivergent group was significantly higher than Normodivergent and Hyperdivergent groups. (p-value= <0.01). A significant correlation existed between masseter activity and bite force. Conclusion: The bite force of Hypodivergent jaw base individuals is highest followed by Normodivergent and least in Hyperdivergent individuals.The strong correlation between the muscular activity and the bite force is definitely a contributor to the anchorage value during treatment by fixed Orthodontics. VIJETA, Ramya; B, Sangamesh. Correlation between masseter muscle activity and maximum bite force among various facial divergence pattern.. Journal of Oral Research, [S.l. ], v. 8, n. 1, p. 59-65, mar. 2019. ISSN 0719-2479. 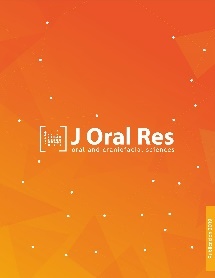 Available at: <http://www.joralres.com/index.php/JOR/article/view/joralres.2019.004>. Date accessed: 25 apr. 2019. doi: https://doi.org/10.17126/joralres.2019.004. Masseter muscle; bite force; electromyography.